Below are examples of typical BEDTools usage. Additional usage examples are described in section 6 of this manual. 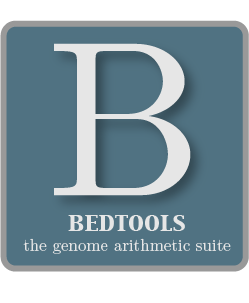 Using the “-h” option with any BEDTools will report a list of all command line options. A. Report the base-pair overlap between the features in two BED files. C. Read BED A from stdin. Useful for stringing together commands. For example, find genes that overlap LINEs but not SINEs. D. Find the closest ALU to each gene. E. Merge overlapping repetitive elements into a single entry, returning the number of entries merged. F. Merge nearby repetitive elements into a single entry, so long as they are within 1000 bp of one another.